Cowboys and Aliens? I'm sure most of you think that new movie with Indiana Jones and James Bond battling ET in the Wild West is the first time these two crazy genres were melded together? WRONG! Coming July 5th from Shout! Factory is Oblivion, a 1994 low budget sci-fi western from Charles Band's Full Moon Entertainment. I thought the idea of Cowboys and Aliens was interesting and, though not expecting much considering it was made by Full Moon, I decided it would be worth a watch. 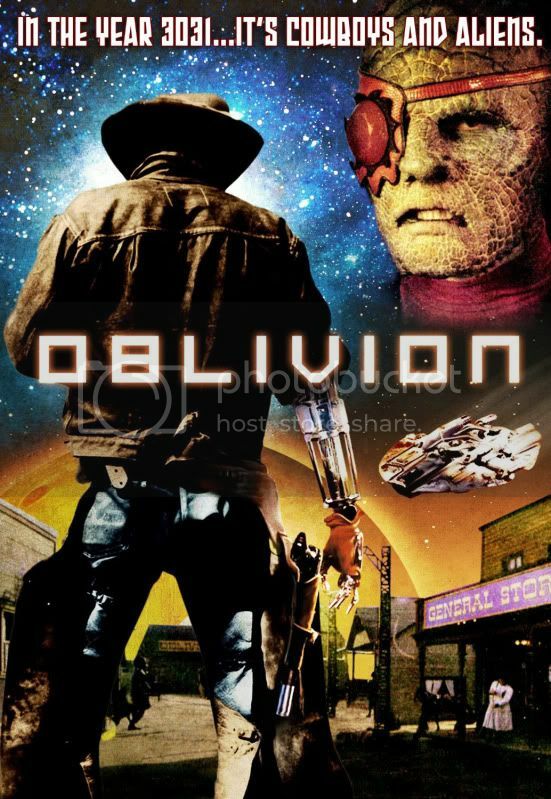 Oblivion, a futuristic western town is being taken over by hideous alien cowboy Redeye (Andrew Divoff) and his horde of baddies - femme fatale Lash (Musetta Vander), boneheaded Bork (Irwin Keyes) and more. The town's sheriff is gunned down by Redeye and it looks like the townsfolk are doomed. Enter the sheriff's estranged son Zach Stone (Richard Joseph Paul - three first names?) and his Native American friend Buteo (Jimmie F. Skaggs - now that's a name!) to clean up and fight for justice. Oblivion was a silly, action-packed, sci-fi romp with a fun story and great cast. The film is like a who's who of b movie stars and has-beens - Catwoman Julie Newmar as Miss Kitty, Star Trek's George Takei as hard drinking Doc Valentine (using as many allusions to Star Trek as possible), The Addams Family movie's Lurch Carel Struycken as the grim reaper Gaunt and They Live's Meg Foster as cyborg Stell Bar. The special FX in Oblivion are surprisingly well done, especially the "Night Scorps" scene at the end. The story is hokey but it works and has its tongue firmly planted in its cheek. The DVD from Shout! Factory looks pretty good but I can tell the source was not the best to work with (very common for the seemingly endless DTV output from Full Moon in the 80s and 90s).